This week we have a guest author, Christine Hirlehey. 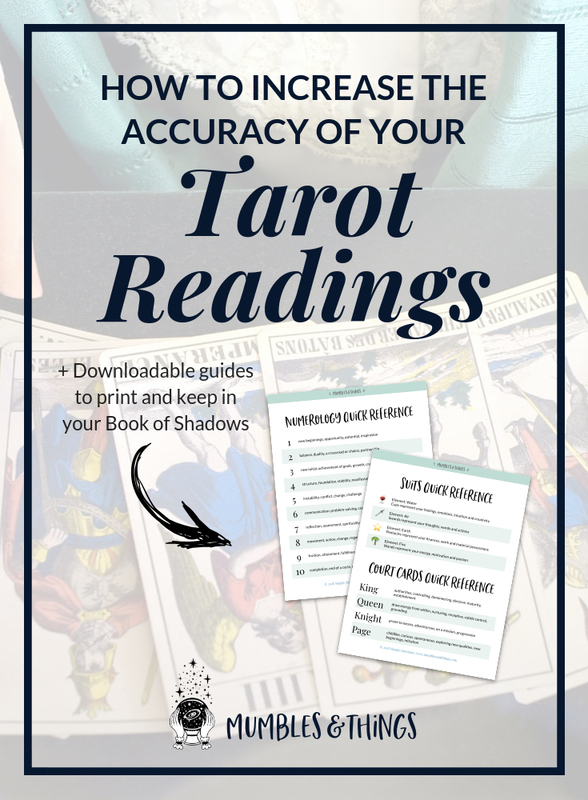 She has several tips for increasing the accuracy of your Tarot readings. If you would like to write for Mumbles & Things, please visit the guest submission page. Okay, here’s the post! So, you have been bitten by the Tarot bug! You have your own Tarot deck and have started doing readings for yourself (and maybe some close friends). But you have reached a point where you don’t feel like you are getting as much out of your readings as you could. This is a common experience when starting out with Tarot. After the initial learning curve, it is normal to start to wonder how you can go deeper. Here are five things to consider if you want to deepen and improve your Tarot readings. If you are just starting out with Tarot, read the beginner’s guide. Tarot is all about accessing your intuition, so your intuition (rather than your Tarot deck) is in fact the most important thing that you will bring to a reading, so developing your intuition is one of the fastest ways to improve your Tarot readings, as well as many other aspects of your life. Intuition is described in many ways, but for me it is the information that is held in our subconscious. Our senses (including psychic senses) absorb so much information about the world that it is impossible for our conscious mind to process it all, so our conscious mind filters that information and only gives us what it thinks we need. But the subconscious mind keeps and processes all the information gathered by our senses and will send us that information in times of need, often manifesting as an unexplained feeling or gut reaction. Tarot is about actively accessing the information held in our subconscious, rather than waiting for circumstances to send the information up. Meditation is one of the best ways to improve our access to information in our subconscious, as it quietens the interfering noise created by the conscious mind. We all know that we have random, and seemingly uncontrolled thoughts in our conscious mind. Sometimes they are distracting thoughts about cake in the pre-lunch meeting, sometimes they are unkind thoughts telling us that we will never be good enough to achieve what we have in our hearts. These thoughts are sent to us by our conscious mind to tell us what we need (food), or to try and keep us safe by keeping us within a space that it has decided is safe. Quieting these thoughts is good for our overall mental health, and also creates space in our conscious mind to draw more information from our unconscious mind. Meditation is all about quietening those thoughts. While there are many different ways to practice meditation, what they all share is that they involve recognizing the noise in our conscious mind for what it is and putting it to one side in order to create quiet. If you are new to meditation, read this complete guide to starting a meditation practice. Along with meditation, practicing presence can also help develop your intuition. Presence is in essence focussing on the present moment, minimizing the distraction of worrying about what will happen next week, or what is happening somewhere else. This is useful both because it increases your awareness of what is happening around you, improving the quality of data collected by your subconscious, but with your mind not distracted by other things, you are more likely to receive information from your subconscious about the present moment. Mindfulness is one of the best ways to build your presence. It provides exercises such as concentrating on the food you are eating or some texture that you are touching that help focus you on the present moment. For a full guide visit mindful.org. Meditation and mindfulness will help you get in the right state of mind for reading Tarot in general, but you also need to make sure that you are in the right state of mind for a particular reading. If you go into a reading feeling highly emotional, worried, or distracted, this will cloud your reading, as these thoughts will be in the front of your conscious mind, overwhelming and blocking information on other things from your subconscious mind. Before you conduct a reading, complete rituals that work for you to clear your mind and bring your emotions into balance. A quick meditation practice, just 5 or 10 minutes, can be enough to bring you to an even keel. It can be great to couple these with some positive affirmations that reassert the faith that you have in your intuition and your ability to take control of your world. The role of the cards in a Tarot reading is to help you access your intuition, so you want to develop a connection between your intuition and your cards. The best way to do this is to spend time with your cards, so that your subconscious knows them intimately and can access knowledge from them easily. Dealing the cards is as much a part of Tarot as reading their meaning, as the right cards need to come to the surface, so create a connection between your cards and your hands. Pass time with your cards in your hands, holding them and shuffling them, so that with time you instinctively know how they feel. While holding your cards, draw cards that call your attention and spend time with them. Re-read what the card means according to your Tarot guide. Look at the picture and decide what parts of its meaning are strongest for you, and what other meanings it might have. Pay attention to how the card makes you feel. Doing this will pass this information into your subconscious for when you need it during a reading later. If you find that you struggle with the cards that you have, that they just don’t speak to you or their meanings don’t stick, consider trying a different deck. Everyone will have an affinity for different types of Tarot cards and sometimes there is some trial and error in finding the right cards for you. Read more on the meaning of each Tarot card. Keeping a diary of all your readings can help you improve quickly. Record what you had in mind when doing a reading, what cards came up and in what combination. Record the reading you made at the time, and later revisit the reading and add retrospective information, indicating where your reading was very accurate, and where it was a bit hazy or unclear. By revisiting this regularly, you will start to notice when the same card or card combinations come up and a recurring meaning that they have, and get a better understanding of where your intuition is strong, and where you have trouble seeing. Spending time with other Tarot readers, simply talking about the cards, swapping experiences, or doing readings for one another, is one of the fastest ways to improve your reading. Colleagues in Tarot can show you new draw arrangements that work for them and you might want to experiment with. They can reveal things about the cards that they have spotted as meaningful that might also speak to you. They can also simply give you the opportunity to practice, which is the most important tool for mastery. What are your tips for becoming a more accurate reader? Tell us in a comment below!